How to choose the right surge protector? Choosing the right surge arrester and protective circuit breakers involves a considering a wide range of parameters related to types of surge protection devices, circuit breaker arrangements and risk assessment. 1-Familiarise yourself with types, or category, of SPDs. 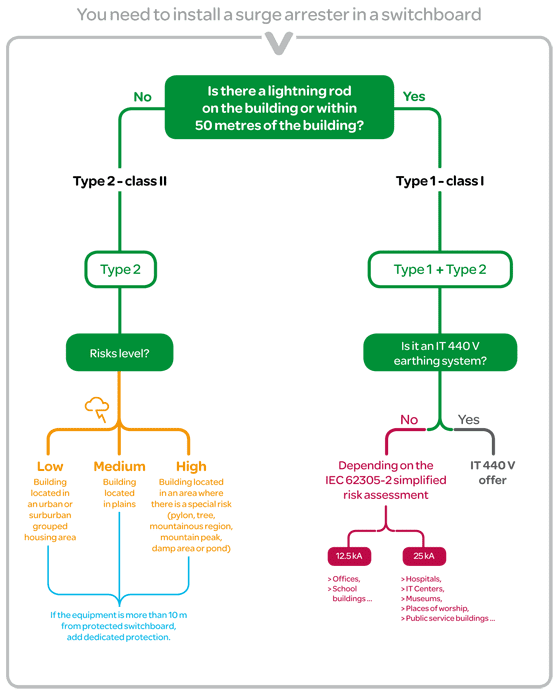 2-Assess the risk of lightning strikes and discharge capacities. 3-Use devices to protect the surge arrester itself. To protect a distribution switchboard, you need only install a Type 2 arrester with discharge capacity In>5kA.(8/20). Assessing risk is generally a complex, painstaking process. A good starting point is to think about what kinds of areas are most and least at risk. You can then consider the type of SPD best suited to the kind of building you’re planning to protect – if it has a single service entry switchboard. Lightning strikes 90% of the earth. Some parts are highly prone to lightning strikes. Some hardly at all. 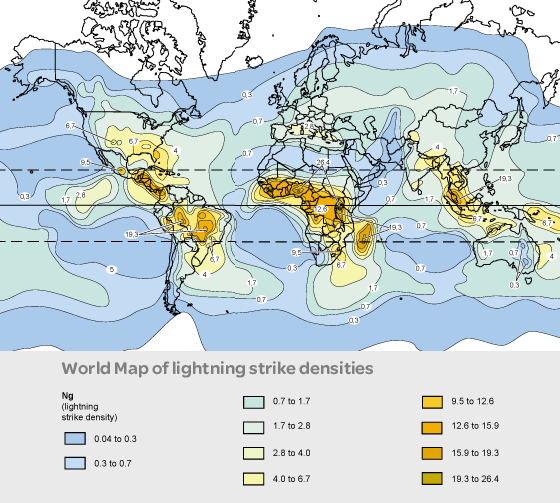 For example, lightning density (number of strikes per kilometer per year) in Belgium is 1ng, while in South Africa it is 150ng. However, lightning density is not per se a risk. 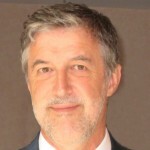 France, for example, includes Ng it in its national standard NF C 15-100. Spain does not. Use European to risk assessment standard EN 62305-2. Some countries make it compulsory to use the standard when considering surge protection for big and or highly sensitive buildings like industrial facilities, hospitals, and data centres. Otherwise, bear this rule of thumb in mind: always install a Type 2 surge arrestor. If the distance between the surge arrestor and the equipment to be protected is greater than 10 metres, then add a Type 2 or Type 3 arrester. a) Thermal runaway caused by the constant excessive constraints of an SPD not exceeding its lightning attributes could lead to the slow destruction of internal components. The disconnection of the SPD is provided by a thermal fuse associated with the electronic components (MOVs) inside the SPD. b) A short-circuit due to exceeding the maximum flow capacity or due to a fault under 50hz from the electrical distribution network (e.g. neutral rupture, phase-neutral inversion). The disconnection of the SPD is provided by an external or integrated short circuit protection device like fuse or circuit breaker. Although you may have to choose an external circuit breaker, more and more manufacturers incorporate them in the same enclosure. You choose a circuit breaker according to the short circuit current in the building where the surge arrester is installed. So, for example, a disconnection circuit breaker with a short-circuit breaking current of <6kA is suitable for a residential building. For an office, it is usually 15kA or 20kA. But determining matches is a delicate business. Manufacturers publish surge-arrester/circuit-breaker coordination tables . 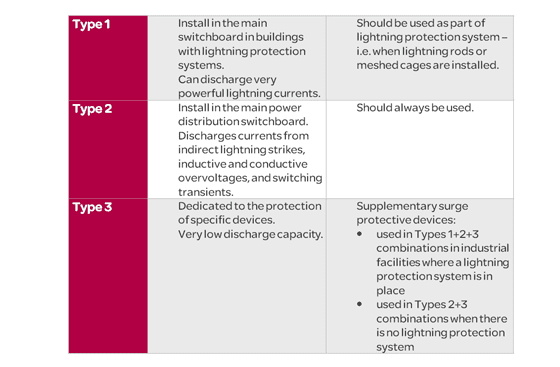 The schematic below gives you an idea of the basic parameters you should factor into your choice of surge protection. Check out and download this software (5.2Mo) to know about choosing the right surge protection devices and circuit breakers for the right application. can you explain a bit more why it’s better to protect your SPD with circuit breaker instead of fuse ? The email invite for the survey said that I would be entered into a raffle but I was never asked for my contact information. We apologize for this issue. Your name is submitted into the list of potential winners and we appreciate your patience and response to this matter. Good luck! Thanks for the timely advice as we approach the summer season. We underestimate our vulnerability ! what is the difference between class 1 and class 2 surge arrestor? Is Class-II SPD is suitable for Home System. If yes, which SPD we use like model, power etc. we have 220v 3 phase system in our region. In a building, we have main LVSB, floor main DB, and terminal DB’s, is it required to install SPD in all switchboards, distribution boards, IT power distribution boards? How many strikes can a Type 2 surge protection device take? i use NW800A TP ACB (Masterpack ) Schneider make for my main L.T panel . please suggest me Is NW800A ACB required for separate SPD for our system safety protection?